Can I Contest an Unfair Non-Compete Agreement? Question: Can I Contest a Non-Compete Agreement If I Think it is Unfair? The agreement must be valid, that is, it must meet all the criteria for being able to be considered by a court. The agreement must be considered in light of a specific state's stance on non-compete agreements. Some states will uphold non-compete agreements, while others will not. A non-compete clause or agreement, sometimes called an agreement not to compete, provides a protection for an employer or a new business owner against an attempt by a former employee or former owner to set up shop nearby and compete for customers. You could have an attorney give you a legal opinion on the validity of the agreement, but this opinion wouldn't guarantee you anything. You need to find out whether non-compete agreements are upheld in your state, and an attorney who practices in that state can tell you, more or less. You would have to break (breach) the contract by being in competition, then see what happens in court. This method can cause you much trouble and may take years to resolve. Let's say were an employee and you wanted to leave and set up a competing business within the radius and time of the non-compete agreement, (in other words, if you wanted to breach (break) the agreement). The first thing your former employer would do is find a judge to put an injunction (stop order) on you to stop doing business and taking the other party's customers until the case was figured out. This might take years. Meanwhile, you would have to stop doing business or move out of the area. Even if you win in court, it's many years, and many, many dollars to attorneys later before you get satisfaction. Is it worth it? Not usually. Even if the agreement is non-enforceable or outrageous, and a judge finally sides with you, you can't win; only the attorneys do. The best thing to do if you want to contest a non-compete agreement is to get an opinion on its validity before you sign it, and then don't sign if you feel it isn't valid. 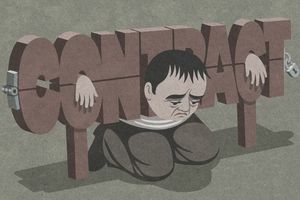 In many cases, though, it is not possible to avoid signing a non-compete, even if you feel it isn't going to be upheld. In that case, it's best to avoid trying to beat the non-compete. Disclaimer This article and all information on this GuideSite, are for general information purposes only. This article is not intended to be a legal opinion or to give legal advice. Each situation is different; consult an attorney for assistance with your specific situation.